In this provocative study, John H. Cleland takes up the problem of the crusade. Beginning with the question of whether or not the use of physical coercion—even killing—can be a truly Christian action, the author analyzes the pertinent sources to lay the foundations of a crusade theology. Such a theology has broad and obvious implications in the modern world. A thorough study, Cleland’s article will be divided into two major parts, the second to appear in the next (Winter 1975-76) issue. In that issue he will conclude with an examination of the ethos of Christian knighthood. In the first part, which follows, he concerns himself with the basic underpinnings of the crusade ideal in philosophy, justice and Scripture. The founders of crusade theology who are discussed in this paper, though some of them lived long before the crusades, were certainly interested in changing the world. That is not by any means to say that they ignored the supreme human dignity of speculative thought. Indeed, much of that which follows deals with their speculations about what is necessarily true of war, always and everywhere. The founding fathers of the crusades disagreed to a man with any Marxian-like inflation of human possibilities here below. And yet they fathered an idea whose historical impact—after 700 years—challenges that of communism. The very term crusade persists to this day as the most exact one-word description in English of any idealistic enterprise. The men originally inspired by the ideal participated in crusades that stretched over nearly 200 years, from the 11th to the 13th centuries. (2) Those crusaders were in part successful. That in the end they failed to achieve their central objective, to rid the Holy Land of Moslem occupation, is only what may be said of nearly all the grand historical designs that God’s providence so far has molded. That the good the crusaders also did was largely leavened with evil may be said of every war that has ever been waged. Before tracing the development of the seminal strands of crusade theology, it is worth briefly reviewing the certain and presumable facts that led Pope Urban II to call in 1095 for the First Crusade. The foremost fact was Turkish occupation of Jerusalem, since 1076, and the attendant interruption of Christian pilgrimages to the Holy Land. Another was the papacy’s desire to reinforce Byzantium against continuing Turkish attacks, no doubt partly in the hope that supplying this requested help would heal the schism that had split Christendom in 1054. A third fact was the longstanding desire to transform European militarism to ends loftier than violent private wars between Christians. These were strategic considerations of capital importance for the Church. Giving them motive power were the private interests of the crusaders. In many of the warriors, as their subsequent actions bore out, those interests were base: the desire for gold and precious materials from the east, the territorial greed of landless nobles, sheer thirst for adventure and blood. Still, the main-spring of the action as a whole was the manifest spiritual impact on six generations of the central promise of the Christian faith: God’s offer to unite the very core of His being with that of any man who first perfects himself through service and sacrifice. There is no rational way to verify or even account for that offer. It is a mystery. But it is an intelligible mystery, at least to those who believe Christ is who He claimed to be and meant what He said. Well-documented service and sacrifice did in fact flow in response to what the crusaders believed was Christ’s authentic invitation to pick up the cross of war and follow Him. the cross they picked up was not made of foam rubber. That they picked it up at all suggests a further fact to the Christian understanding, a mystical fact in the true sense of that word. for if the thesis of this paper—that the foundations of crusade theology were solidly and lastingly built—turns out in fact to be true, then it becomes reasonable to believe that the better crusaders began at least to live the interior life of grace and union they sought. It becomes possible even to believe, without exaggeration, that the very finest of the crusaders lived that interior life in its highest degrees of mystical intensity. The possibility of those interior dispositions in many crusaders and the spiritual ends of papal policy to which the interior dispositions were harnessed explain, in the fullest sense, why the epithet holy attaches historically to these wars. That a war in Christ’s name can be holy merits some discussion. some contemporary historians claim that the Church of the first three centuries was pacifist on principle. they often cite in support of that argument two or three demonstrable facts. They point out that Christianity, unlike Islam, was not born militant. They cite a number of leading Christians of the era whose thinking does in fact show a pacifist tendency. And they point to the wholesale abstinence by early Christians from service in the Roman army. To put these facts into context, however, is to make the pacifist case much less than air-tight. Christians living in apostolic times and the centuries immediately following were an isolated, alien minority with no public responsibilities. There is no question that the Church was slow to come to grips with the paradox of war and peace. Some early Christian thinkers, Tertullian most colorfully, even advocated secession from society. Others such as Origen drifted toward a general feeling that it is always wrong to kill a fellow human being, since each person is created in the image of God: “. . . God did not deem it becoming to His own divine legislation to allow the killing of any man whatever.” (3) Refusing to serve in Rome’s military, however, made good moral and practical sense apart from pacifist principles. Adherence to the First Commandment of God and to a first principle of common sense surely were reasons enough to shun if not despise an army that made idol-worship obligatory and enforced Rome’s official anti-Christian policies. And Tertullian, Origen, and some others to the contrary notwithstanding, there is no record of the teaching authority of orthodox early Christianity ever even addressing itself to the matter of war directly. The bishops of the first three centuries evidently considered that they had more important pastoral matters to attend to. Nor did the church have any need to lead society as a whole in matters of war and peace until Constantine started Christianity on its way to becoming the master ideology of the Greco-Roman world. With the Edict of Milan in 313 Christianity’s sense of public responsibility, temporal as well as spiritual, began to grow. By degrees, the Church realized how radically opposed Christian peace and temporal war seem to be. The question was how war could be reconciled with Christ’s clearest command of all, that of loving and serving one’s neighbor even to the point of returning goodness for evil. If reconciliation were impossible the Church would face the clear dangers of two possible conclusions. Either Christian dogma would appear inapplicable for men living in ordinary society, and at best irresponsible counsel for them; or else society would appear so unreal for true Christians that they would have to secede as gracefully as possible from it, as Tertullian suggested, and let the world go its own way. Many today think it outrageous to employ physical force for spiritual ends. That view, however, does not take proper account of the full implications of the medieval—or indeed the Christian—metaphysical understanding that a whole person has two components: a corporeal body and an immaterial soul, both of which are needed for true human existence. The recognition of this duality in human existence obviously has great implications for interpreting the legitimate means of action of the Church. But it usually will, Toynbee implied. And to prove that thesis, he attributed to Pope Gregory VII—for ‘wrongly’ choosing material ways and means of combating imperial force—many of the modern ills of Christianity. Perhaps Toynbee was right. But what interests me more, here, is the metaphysical inference that may be drawn from his metaphor about Gresham’s Law. The inference is that there is not only more worth in using spiritual rather than material means to accomplish spiritual ends, but that the two means are mutually exclusive. Toynbee was concerned to judge Gregory’s actions not so much by the standard “thou shalt not kill” as by the standard “thou shalt pray.” A corollary inference seems to be that while danger is the inevitable condition of being alive as a person, it is not even a desirable condition of being alive as an organized Church. He conceived of no legitimate material extension of the Church, of any consequence, and no extension at all into arenas of normal human action. The medieval view also contradicts Toynbee’s as to the raison d’etre of the Church. The crusades themselves make clear that ordinary Christians of that age saw the Church as more than the earthly repository of divinely-revealed truths and the presiding authority for liturgical service. They saw their Church as a flesh-and-blood organism intended for normal action in the world as well as for religious worship, and dedicated, both physically and spiritually, to embodying Christ’s ideals on earth. The response to papal appeals between 1095 and 1270 was voluntary. And it is worth remarking that no pope or saint could have launched a crusade if the laity had not voluntarily answered his call. The medievals believed, in short, that both the physical and spiritual aspects of being human fall on the same long and unbroken continuum of reality. This conviction was the glue that held Catholic Christianity together for 1,000 years. It enabled Popes Gregory VII and Urban II and their successors to focus and hurl Christians first against the Empire and then against the Saracens. And at bottom it was a metaphysics of man and a working vision of the Church that, for all their differences in emphasis and style, Augustine and Thomas Aquinas essentially shared. The bishop of Hippo is often interpreted by historians of ideas as a Neo-Platonic Christian, or even as a Neo-Platonist who happened also to have been a Christian. His theory of man is then boiled down to posit some sort of self-sufficient soul imprisoned—for 50 to 100 years on earth—in a body. That is an exaggerated reading. Augustine was intensely spiritual, but not naively so. There is simply too much in his works, for one thing, about the reality of the physical side of life. In The City of God, for example, his praise of the beauty of the human body, as it will appear in the next life and as it exists even in this one, is almost ecstatic. (9) Nor does the view that Augustine considered himself an imprisoned Neo-Platonic spirit well account for his 40-year career as shepherd of what may reasonably be supposed to have been an ordinary, more-worldly-than-spiritual cross section of men and women—a collection of people who presumably needed his down-to-earth counsel very much, his spiritual genius not much, and his awesome intellect not at all. The sum of St. Augustine affirms at one stroke the existence of man—not only one half of him, destined to struggle desperately to rejoin the other half. The fact that Gilson is a thinker of essentially Thomistic persuasion does not alter the correspondence of his point here to the Augustinian passage that precedes it. In that passage, Augustine did not attempt to paper over either war or the possibility of sin in warfare. He located any sin involved in soldiering in the will and motivation of the soldier. He treated the death and suffering and fraud and greed and cruelty and wrong that always occur in war with a psychological realism that frankly admits their real existence. He paid controlled brute force the compliment of calling it a positive good when it is embodied in a good will and employed properly “in the conduct of human affairs” against evil-doers. He thus went well beyond justifying war negatively, as an evil that may only be undertaken when the alternatives are more evil still. In war, as in all else for Augustine, everything depends on the will, which is either good or bad. All of this mainly proceeds, in my opinion, not from any Puritanical infatuation with Old Testament warfare; not certainly from any secularist infatuation with the City of Man; not from any great need to extricate the Catholic Church of his day from the grip of imperial force; not even from any desire to found an ethos of war, despite the fact that he did originate the just-war theory and a little more. Augustine’s thought proceeds, rather, from a metaphysical recognition that man is animal as well as spiritual, and from the consequent psychological realism that accepts force and war as conditions that can never be eliminated. He says they may be ameliorated, however: by making careful theoretical distinctions about where the evil of violence necessarily resides. And he explains how, as a practical matter, to ameliorate them: by eliminating what truly is evil from Christian conduct. This line of thought enabled Augustine to interpret Christ’s words about the Church not being of this world to mean that its essential purity tends to raise it above the things of earth, without suggesting that the Church’s work does not lie in this world, among men who may be as real and as menacing as the Seljuk Turks, and within the framework of human interests and institutions, even when those interests and institutions initiate or are dragged into war. Around the time he was preparing that formulation for the article on war in his Summa, he conducted one of those academic debates that were called Quodlibetal Questions. In it he added theological precision to the idea of the special crusade indulgence (or commutation of penance) that, along with papal authorization, constituted one of the defining elements of a crusade in canon law. Thomas outlined the requisite authority and cause of such a war and the subjective state necessary in a crusader for efficacious reception of the indulgence. It is important to note the conditions here set forth. There is a demonstrable need for armed intervention in a specific place. There is demonstrable authority in the office of the man who calls for that intervention. And there is a definite interior disposition needed in anyone who hopes to be rewarded for answering that call. It seems to me that Augustinian and Thomistic philosophical principles complement each other with special force in the development of crusade theology. Augustine made lasting distinctions between soft pacifism and hard cynical realism. He recognized that both sinfulness and goodness in the human soul have material consequences and, in the case of the latter, resulting material responsibilities as well. Thomas completed the picture. He in effect distinguished between genuine religious warfare, the secondary causes of which can be defended on rational grounds, and the counterfeit religious warfare that springs from some claimed perception of the arbitrary working of God’s will, the secondary causes of which cannot bear scrutiny. Thus Christian philosophy more than overcame the seeming contradiction between making war and turning the other cheek. If it may be said that Christian philosophy even went beyond the just-war theory, I think it also fair to say that medieval Christianity’s understanding of justice edged war theory in general even closer to proclaiming the positive good that some controlled application of force can occasionally do. The canon lawyers Anselm of Lucca and Gratian were important in this development of crusade theology, although the earlier tone set by Ambrose and Augustine has had an even more lasting influence on the Christian attitude toward war. And giving systematic embodiment to this tone, to a degree beyond even that of Charlemagne, was the Christian Roman Empire, especially as led by Emperors Justinian and Heraclius. It is a very short step from that kind of policy to at least selective application of coercive material force within a state. And from that, it is but another short step to application of power beyond the borders of a state. Both fall under state defense of the faith. This interpretation explains Justinian’s alternating efforts to repress the Monophysite schismatics on one hand and on the other to persuade the Church to modify its Christological doctrine in order to appease the Monophysites. It also explains how Heraclius’ campaign to regain Jerusalem from the Persians took on, in the view of H. St. L.B. Moss, “the aspect of a crusade”. (18) It was a view of natural justice, then, that inspired the Byzantines to impose order on the civilized world and to build up Christianity in the process. Two pages later he lamented but did not deny the Stoic maxim that “the wise man will wage just wars”; and he in fact attributed truth to the maxim because of the “wrongdoing of the opposing party,” by which he meant the sort of wrongdoing that seriously injures society. The sort of thinking reflected in the foregoing dictum seems clearly to have inspired Anselm of Lucca’s theological attempt to complete the reconciliation of coercive force and charity. Paraphrasing from On Charity, Anselm’s chief theological work, Father Leclercq says physical force is employed charitably when it protects those who wish to live a good life, by destroying those who harry them; or when it is employed with the intention of morally healing wrongdoers. (22) In a later footnote, Leclercq comments that R.W. Southern’s description of Gratian’s Causa XXIII as “the first serious discussion on problems of war in Medieval Europe” fails to take proper account of Anselm’s work. (23) That is probably true, in terms of post-Augustinian Europe. But both Anselm and Gratian mined the rich ore of charitable coercion in Augustine. One of the important distinctions Gratian made in his Causa XXIII is between injuries committed against one’s own person and those committed against God and/or one’s neighbor. He cited a letter Pope Gregory the Great wrote to one Bishop Ianario. In the letter Gregory reprimanded the bishop for imposing sanctions on someone who had physically attacked him (Ianario). Gratian’s point is that sins against one’s own person should be borne patiently, but sins against God and neighbor ought to be punished out of charity. Purely in terms of killing, which certain Old Testament and even New Testament books condone as licit under certain circumstances, (30) Bainton is probably right about the theoretical indeterminateness of Scripture. But in terms of the larger matter of war, a book which teaches that there is a time for peace and a time for war (Ecclesiastes 3:8) can hardly be called indeterminate; both conditions are determined to be possible; it is only the timing of each that is open to question. That being so, one can see how easy it would have been for medieval Christians already inclined to fight in the Holy Land to find justification for their dispositions in both Books of Scripture. The obvious net effect of doing that was to move crusade theology well beyond the theoretical justness of any war, beyond the realm of state defense of the faith, and even a bit beyond the positive good of charitable coercion. Karl Marx, Theses on Feuerbach in Marx & Engels, ed. L. Feuer (Garden City, 1959), p. 245. Roland H. Bainton, Christian Attitudes Toward War and Peace (Nashville, 1960), p. 78. 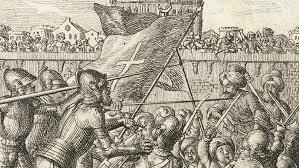 Not all leading Christians favored the development of crusade theology. Peter Damien and Anselm of Canterbury were the most prominent holdouts on the eve of the crusades. I shall pass these by, however, since my subject is how crusade theology grew, and not how it was resisted. Arnold J. Toynbee, The Downfall of the Papacy in The Investiture Controversy, ed. K.F. Morrison (New York, 1971), p. 123. In analyzing the piety of St. Francis, St. Bonaventure clarifies this aspect of the Christian life (see Journey of the Mind to God, Prologue). But it was St. Bernard more than anyone else who seems to have focused medieval religion on our Lord’s humanity. In his 20th sermon on The Song of Songs he stresses that Christ appeared as man so as to win men’s affections “by first drawing them to the salutary love of his own humanity, and then gradually to raise them to a spiritual love.” This first attraction Bernard termed carnal, which becomes better as it becomes rational, and becomes perfect when it is spiritual. Bernard taught this progression can apply even to the work of war. Short Studies on Great Subjects (Ithaca, 1967) 111. St. Augustine, The City of God, ed. R. Hutchins (Chicago, 1952), book XXII, chapters 19, 24. St. Augustine, The Nicene and Post-Nicene Fathers, ed. P. Schaff (Buffalo, 1887), v. IV, p. 301. Etienne Gilson, A Gilson Reader (Garden City, 1957), pp. 82-104. St. Thomas Aquinas, Summa Theologica, 2a2ae, 40. LeRoy Walters, The Just War and the Crusade in The Monist, 57 (Oct. 1973), p. 587. Early Latin Theology, ed. L. Greenslade (Phila., 1956), v. V, Library of Christian Classics, 178-81. The Making of Europe (Cleveland, 1956), 55-6. Speaking on Peace and War in Byzantium, Jan. 18, 1974 at the University of Chicago. The Birth of the Middle Ages (London, 1935), 139-41. See note 10 (p. 300). The City of God, p. 513. The Nicene and Post-Nicene Fathers, vol. I, p. 485. Saint Bernard’s Spiritual Attitude to War (1972), in Studies in Medieval Cistercian History III, ed. Bernard McGinn, p. 6. New Catholic Encyclopedia on War, volume 14. M.-D. Chenu, Nature, Man and Society in 12th C., 158. The Letters, ed. & tr. James (London, 1953), 145. The Deeds of the Franks and the other Pilgrims to Jerusalem, ed. R. Hill (London, 1962), p. 1. Paul’s approval of capital punishment (Acts 25:10f).